Prepare to shed a tear (or a thousand). 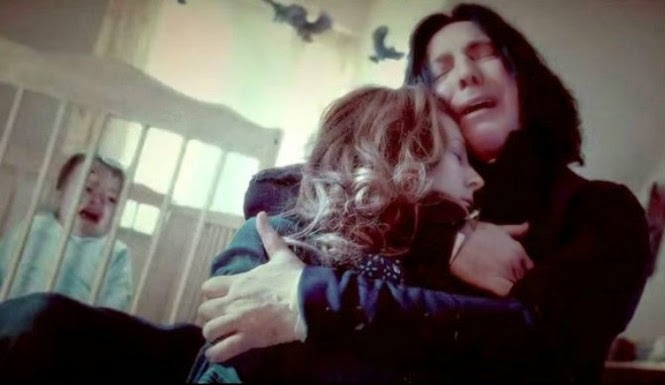 A Harry Potter video has been touching the hearts of many; an emotional homage to the late Professor Snape. The video compiles this character’s most pivotal scenes in chronological order, effectively relaying the story of his life, love, and loyalties. Throughout the saga that is Harry Potter, Professor Snape was quite the contested character. Introduced in the first novel, Harry Potter and the Sorcerer’s Stone, Snape quickly revealed himself to readers as antagonistic towards Harry. While Harry was attending his very first potions lesson, Snape called him out in front of the entire class for his celebrity, which he gained by surviving a deadly curse at the hands of Lord Voldemort. Per Refinery 29, the video was created and posted to YouTube by the user kcawesome13. It begins with Snape’s pre-teen years, where he falls in love with Lilly Potter, and ends with a grown Harry Potter speaking to his son who is named after the late professor and headmaster of Hogwarts School of Witchcraft and Wizardry. As the video progresses, one bears witness to the tragedy that is Professor Snape’s life. From his undeniable and unrequited love for Lilly Potter and resentment for James Potter to the love, loyalty, and arguable near cruelty he bestowed upon Harry, the video pieces together the complexities that are Professor Snape. However, as Bustle conveys, there were those, both fictional and reader alike, who despised the professor. Due to the duality of his character, many readers were uncertain as to whether or not Professor Snape was on the side of good or evil. As the video depicts, Snape’s actions made it difficult to ascertain whether his loyalties laid with Voldemort or with Professor Dumbledore and Harry Potter, adding validity to this divisive apprehension. Nonetheless, this homage to the contested professor may very well provide a new perspective from which to view the Harry Potter series, as well as cause some to view Snape with kinder eyes.